For undergraduate courses in Corporate Finance. 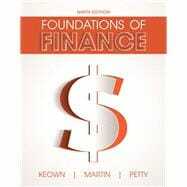 Foundations of Finance retains its foundational approach to the key concepts of finance, bolstered by real-world vignettes, cases, and problem exercises. Utilizing five principles, which are presented at the beginning of the book and applied throughout, the authors introduce a multi-step approach to financial problem solving that appeals to readers’ at all levels, math and numerical skills. As in previous editions, the Ninth Edition focuses on valuation and opens every chapter with a vignette based on financial decisions faced by contemporary, real-world companies and firms. Other highly useful features include mini cases, cautionary tales, lists of key terms, and a discussion of ethics. Revised and updated, the newest edition includes new lecture videos, financial thinking, user feedback, and lessons from the recent economic crisis. Note: You are purchasing a standalone product; MyFinanceLab does not come packaged with this content. Students, if interested in purchasing this title with MyFinanceLab, ask your instructor for the correct package ISBN and Course ID. Instructors, contact your Pearson representative for more information. Arthur J. Keown is the Department Head and R. B. Pamplin Professor of Finance at Virginia Polytechnic Institute and State University. He received his bachelor’s degree from Ohio Wesleyan University, his M.B.A. from the University of Michigan, and his doctorate from Indiana University. An award-winning teacher, he is a member of the Academy of Teaching Excellence; has received five Certificates of Teaching Excellence at Virginia Tech, the W. E. Wine Award for Teaching Excellence, and the Alumni Teaching Excellence Award; and in 1999 received the Outstanding Faculty Award from the State of Virginia. Professor Keown is widely published in academic journals. His work has appeared in the Journal of Finance, the Journal of Financial Economics, the Journal of Financial and Quantitative Analysis, the Journal of Financial Research, the Journal of Banking and Finance, Financial Management, the Journal of Portfolio Management, and many others. In addition to Foundations of Finance, two other of his books are widely used in college finance classes all over the country—Basic Financial Management and Personal Finance: Turning Money into Wealth. Professor Keown is a Fellow of the Decision Sciences Institute, was a member of the Board of Directors of the Financial Management Association, and is the head of the finance department at Virginia Tech. In addition, he served as the co-editor of the Journal of Financial Research for 6½ years and as the co-editor of the Financial Management Association’s Survey and Synthesis series for 6 years. He lives with his wife in Blacksburg, Virginia, where he collects original art from Mad Magazine. John D. Martin holds the Carr P. Collins Chair in Finance in the Hankamer School of Business at Baylor University, where he teaches in the Baylor EMBA programs and has three times been selected as the outstanding teacher. John joined the Baylor faculty in 1998 after spending 17 years on the faculty of the University of Texas at Austin. Over his career he has published over 50 articles in the leading finance journals, including papers in the Journal of Finance, Journal of Financial Economics, Journal of Financial and Quantitative Analysis, Journal of Monetary Economics, and Management Science. His recent research has spanned issues related to the economics of unconventional energy sources, the hidden cost of venture capital, and the valuation of firms filing Chapter 11. He is also co-author of several books, including Financial Management: Principles and Practice (13th ed., Prentice Hall), Foundations of Finance (9th ed., Prentice Hall), Theory of Finance (Dryden Press), Financial Analysis (3rd ed., McGraw Hill), Valuation: The Art & Science of Corporate Investment Decisions (2nd ed., Prentice Hall), and Value Based Management with Social Responsibility (2nd ed., Oxford University Press). J. William Petty, PhD, Baylor University, is Professor of Finance and W. W. Caruth Chair of Entrepreneurship. Dr. Petty teaches entrepreneurial finance, both at the undergraduate and graduate levels. He is a University Master Teacher. In 2008, the Acton Foundation for Entrepreneurship Excellence selected him as the National Entrepreneurship Teacher of the Year. His research interests include the financing of entrepreneurial firms and shareholder value-based management. He has served as the co-editor for the Journal of Financial Research and the editor of the Journal of Entrepreneurial Finance. He has published articles in various academic and professional journals including Journal of Financial and Quantitative Analysis, Financial Management, Journal of Portfolio Management, Journal of Applied Corporate Finance, and Accounting Review. Dr. Petty is co-author of a leading textbook in small business and entrepreneurship, Small Business Management: Launching and Growing Entrepreneurial Ventures. He also co-authored Value-Based Management: Corporate America’s Response to the Shareholder Revolution (2010). He serves on the Board of Directors of a publicly traded oil and gas firm. Finally, he serves on the Board of the Baylor Angel Network, a network of private investors who provide capital to startups and early-stage companies.